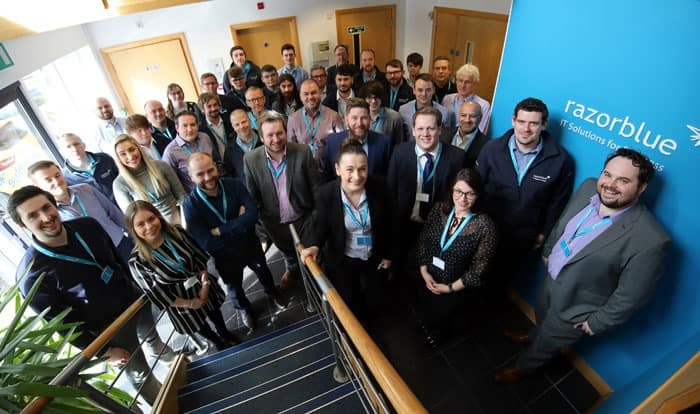 North East business IT solutions provider razorblue is planning further expansion at its Teesside office after seeing a 31% hike in revenue. With offices in Catterick, Wynyard, Leeds and London, the firm specialises in managed IT and security services, super-fast connectivity, cloud and hosting and business software solutions for businesses across a broad range of industries, working with major retailers, manufacturers, professional services businesses and hotels. The firm, which has a number of clients on Aycliffe Business Park, including the Xcel Centre, is now planning to expand its Wynyard operation to accommodate continued growth. razorblue was launched in 2006 by managing director Dan Kitchen and has since transformed and grown at around 30% year-on-year, as well as an uplift in staff of over 100% since 2015. Client satisfaction has been paramount to the firm’s success, an enviable Net Promoter Score of +65 or higher proof of their commitment to giving the best service using their own in-house team of talented IT professionals. razorblue has been providing a 24/7 service to those clients who require round-the-clock support for over three years, as well as uniquely owning and operating their own network and cloud environment which allows them to be 100% accountable. Mr Kitchen said: “We have made significant investment in recent years in providing a true 24/7 service to clients, as well as building our own national network and cloud platform – all services which would complement the acquisition of an existing business which is perhaps struggling to meet the demands of today’s clients, or does not have these in-house capabilities.